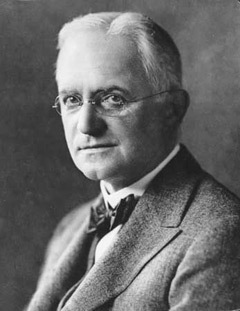 George Eastman was an American innovator and entrepreneur who founded the Eastman Kodak Company and invented roll film, helping to bring photography to the mainstream. Roll film was also the basis for the invention of motion picture film in 1888 by the world's first filmmakers Eadward Muybridge and Louis Le Prince, and a few years later by his followers L�on Bouly, Thomas Edison, the Lumi�re Brothers and Georges M�li�s. He was a major philanthropist, establishing the Eastman School of Music, and schools of dentistry and medicine at the University of Rochester; contributing to the construction of MIT's second campus on the Charles River; and donating to Tuskegee and Hampton universities. In addition, he provided funds for clinics in London and other European cities to serve low-income residents. The George Eastman House, now operated as the International Museum of Photography and Film, has been designated a National Historic Landmark.